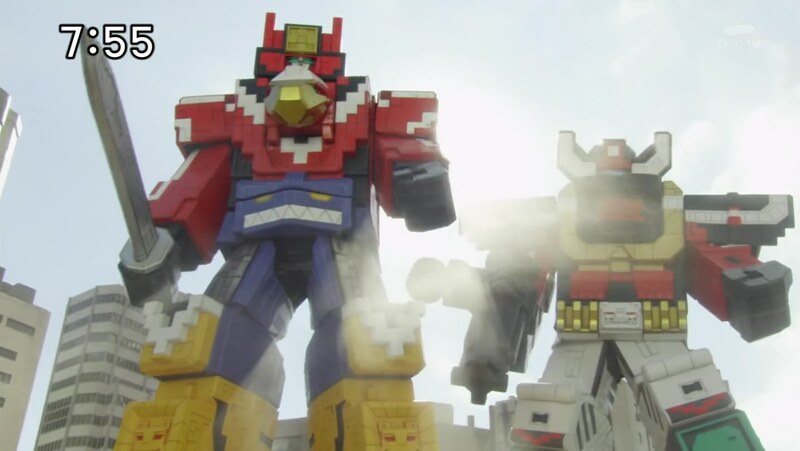 Recap: Doubutsu Sentai Zyuohger, Episode 8 – "Can I touch it?" The Zyuohgers are downtown passing out fliers again. Tusk tells a bored Leo and Sela tells a treat-loving Amu to treat this a little more seriously. Leo sneaks off and sees a guy rocking out with some headphones. Leo tries talking to him. But the guy doesn’t hear, so Leo grabs the headphones and asks what they are. Leo puts them on and is amazed by the sweet tunes he’s hearing from them. The guy goes from afraid to amused. The guy, Daisuke, is very happy that Leo enjoys the music since he composed it. In fact, he has an audition tomorrow. Leo is sure he will pass. Leo’s tail suddenly pops up. He wishes Daisuke luck and runs off. But Leo still has the headphones and mp3 player. Team Azarudo player Yabiker is rampaging and uses his Pararira Pararira sound to make people lose their minds and go violent. Azarudo explains his player’s ability and Ginis is intrigued by this amusing show. Daisuke catches up to Leo just as Yabiker sees them. Yabiker sounds his trumpets, but it only affects Daisuke since Leo is still wearing the headphones and can’t hear the sound. Daisuke punches Leo and then proceeds to punch the concrete pillar. Leo understands how the headphones protected him. He tries to stop Daisuke from going crazy. The others arrive already henshined and Leo warns them to cover their ears. They cover them just as Yabiker lets out another round of trumpets. But hands over ears won’t help Sela who still has super hearing. She starts going crazy and fights Yamato, Tusk and Amu. Leo, still wearing the headphones, henshins and charges toward Yabiker who decides to retreat for now. Yabiker leaving releases everyone from Pararira control. Leo apologizes for taking Daisuke’s headphones, but Daisuke’s got bigger concerns now. His hand is bloody and broken. Up on the ship, Yabiker asks Naria for a tool set that will help him upgrade his Pararira sounds. 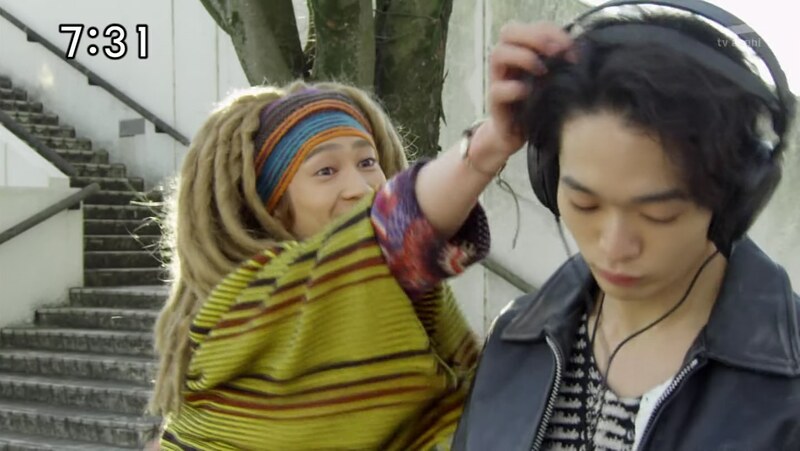 Back at the treehouse, Yamato gives the others headphones and mp3 players to use to protect themselves from Yabiker. But they think Sela should stay home since these things might still not protect her. Sela will definitely not just stay home and give up. Amu notices Leo-kun is not here. Yamato says Leo is at Daisuke’s because he’s worried about his injuries. Daisuke tries using his wrapped up hand to play guitar, but the pain is too much. Daisuke feels defeated and just won’t show up to the audition tomorrow. Leo tells him not to give up, but Daisuke doesn’t want to hear that from the guy whose fault it is in the first place. Leo accepts fault and tells Daisuke to hit him as much as he wants if it’ll make him feel better. But Daisuke must go to the audition. Daisuke says there’s no point if he’ll fail anyway. Leo is fired up and he turns Zyuman, much to Daisuke’s horror. Leo says he isn’t even human, yet he really likes Daisuke’s music. So there’s no way humans wouldn’t like it either. He will make sure Daisuke goes to the audition if he has to drag him there. 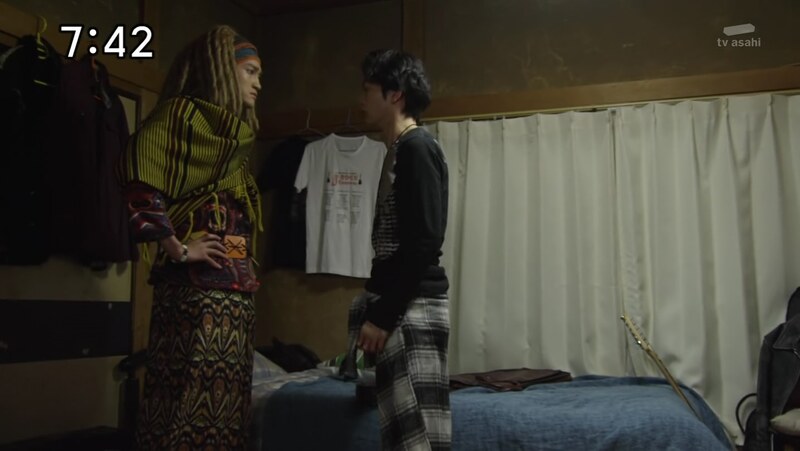 Next morning, Yabiker is about to try his new upgraded sounds, but Yamato, Sela, Tusk and Amu arrive to stop him. They put on their headphones. But Sela also has some extra layers including a scarf and helmet. The others notice that while she may not be able to hear anymore, she also can’t see through all the layers. 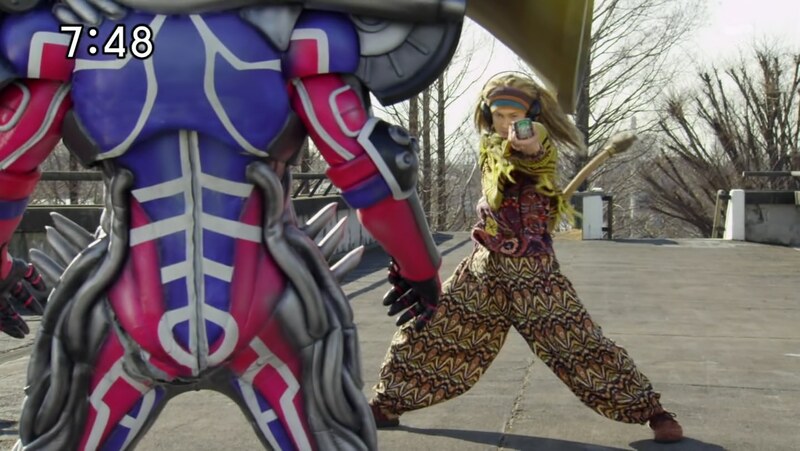 Sela insists she’s got this so they all henshin. Yabiker unleashes his upgraded horns. Turns out, Sela’s extra covering works. But the simple headphones are definitely no match for Pararira 2.0. Across town, Leo visits Daisuke who is just leaving. Daisuke is amazed to see Leo back to being a human, but he sees Leo’s stiff tail pointing up. He asks if he can touch it and Leo says sure. Daisuke may not know what the hell is going on, but if a lion enjoys his music than maybe it’s good enough for humans. So Daisuke will give the audition a shot. Leo promises to defeat the monster. But before he leaves, Daisuke gives him his headphones. Leo excitedly accepts them. 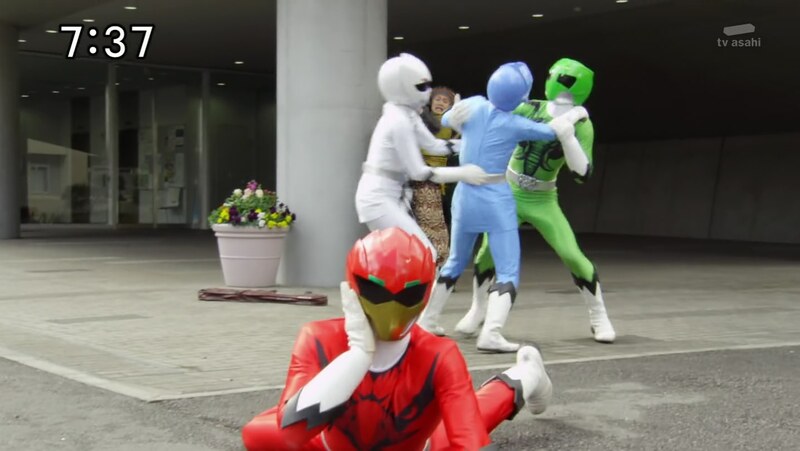 Sela unsuccessfully tries to get the others to calm down. But just before Yabiker tries to turn Sela, Leo arrives. As Daisuke fights through the pain to play his guitar at the audition, Leo puts on his new BFF’s headphones and charges toward Yabiker. Sela warns Leo about the upgraded Pararira, but that is no match for Leo’s resolve to defeat Yabiker. Leo henshins and roars. Very loudly. He leaps at Yabiker and destroys the horn. The others are back to normal. Sela tells Leo that for the first time, she appreciates his loud mouth. Yabiker can’t believe it. 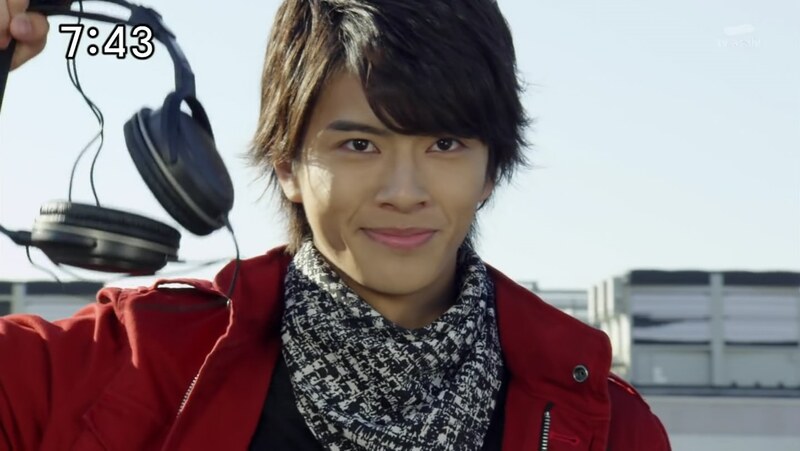 He summons Moebas and the Zyuohgers fight them off. Yabiker isn’t giving up, but Leo gives it all he’s got to wear him down. That allows the five of them to team up to unleash their beasts and deliver a finisher. Naria heads down with some Genis cell coins and Yabiker embiggens. 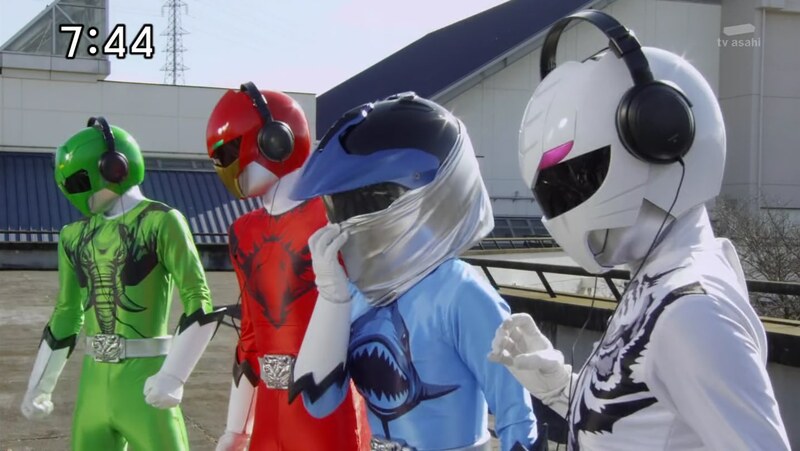 The Zyuohgers hop into their cubes and Yamato, Tusk and Amu form ZyuohWild. 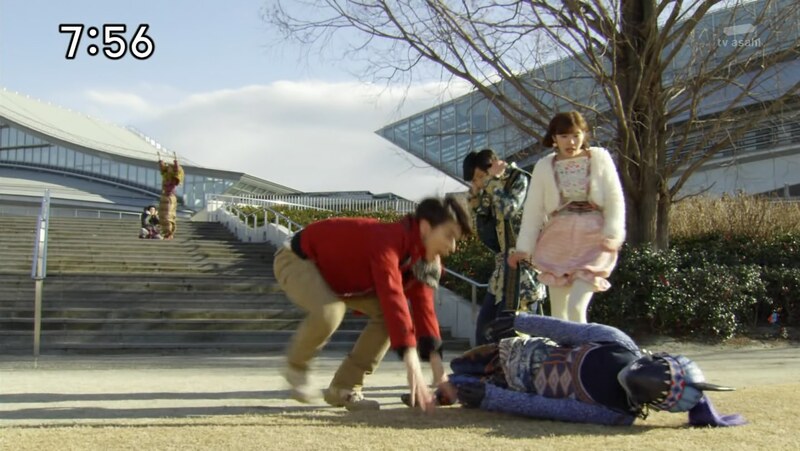 Sela and Leo want to get in on the fun, so Yamato hops out and the three of them form ZyuohKing. The Zyuohgers tag-team it to finish off Yabiker for good. Leo runs to Daisuke who has just come out of the company. Unfortunately, he didn’t pass the audition. Leo blames himself, but Daisuke says it’s alright. Thanks to Leo, he didn’t give up. And now the company told Daisuke to keep in touch with new music. Leo roars with excitement, much to Sela’s renewed annoyance. She faints when Leo roars his loudest. I really enjoyed this episode. Lots of fun character moments. It was a great story for a Leo focus. And using Sela’s super hearing by having her be overly sensitive to Yabiker’s Pararira Pararira and of course Leo’s loud roars was great. The gag with her covering her head up while the others ended up getting hypnotized was fun as well. Using Yabiker’s ability to force Daisuke to break his hand was a good plot point. This was just a well-written episode . Now, it’s pretty unavoidable to ignore the weird sexual innuendo this season. lol First with the feet/sock fetish. Now Daisuke wanting to touch Leo’s stiff tail. I was just watching The 10th Kingdom and remember Virginia stroking Wolf’s tail and it very overtly insinuating something sexual. It was a very similar case here. lol Very strange. Elsewhere, I always appreciate creative MOTW designs. Yabiker was good, especially his mouth. It was a nice little detail you wouldn’t really notice, but when you did, it was nice. The way it simply moved as he talked instead of a bland face was creative. Overall, a very enjoyable episode. 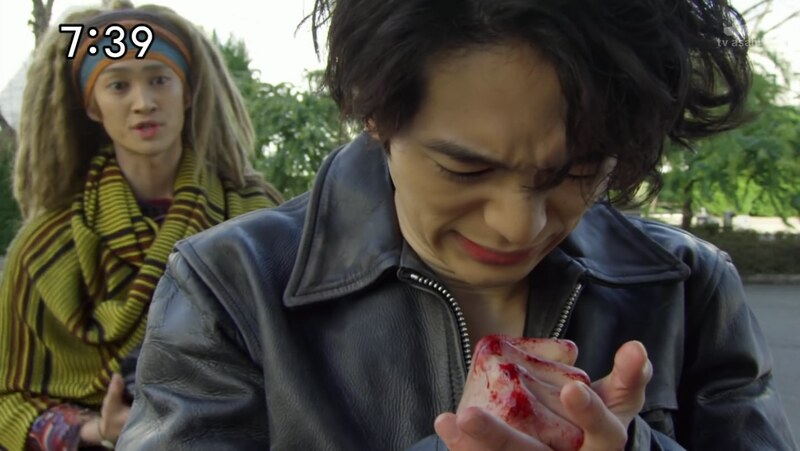 ← Recap: Kamen Rider Ghost, Episode 24 – Appearance! The Mysterious Warrior!